With Super Bowl 50 just a couple of weeks away, the game will be the most technologically advanced game ever played. At least that’s what Super Bowl organizers such as the National Football League, the host team San Francisco 49ers, and Silicon Valley software giant SAP want you to believe, touting the game’s cutting-edge advantages during a panel discussion Wednesday night. Tech will definitely be a focal point not only for the game itself at the $1.3 billion Levi’s Stadium in Santa Clara, California on February 7, but also for the crowds expected to converge on downtown San Francisco to partake in weeklong pre-game festivities at Super Bowl City. A million football fans are expected to try out such fan-friendly interactive games Amp It Up and Breakaway inside the Fan Energy Zone sponsored by SAP. 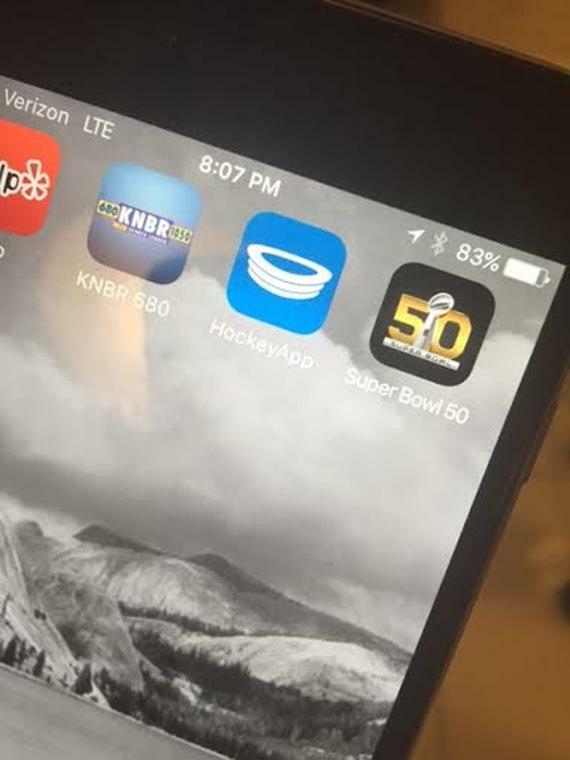 A beta version of the soon-to-be released Super Bowl 50 app. Organizers say the big game on February 7 is going to be the most technologically advanced Super Bowl ever. It’s all a prelude to the golden anniversary of the Super Bowl, the NFL’s marquee event and one of the most anticipated sporting events of the year. More than 72,000 fans are expected to attend the game and another 110 million more watching on TV. The spectacle is expected to be the techiest Super Bowl in history as it’s being played right in the heart of Silicon Valley. Guido also showed off a beta version of the Super Bowl 50 app, teasing that those must-see commercials might be shown on it. “Maybe,” he said. With technology also comes possible pitfalls, conceded Aidan Lyons, the NFL’s vice president of fan centric-marketing. But he’s not too worried, believing the league and the game’s sponsors are going to put its best effort forward on site at the game, but also at Super Bowl City. He said fans can use the NFL Fan Mobile Pass and a Road to 50 app to help them get around. With major issues such as affordable housing and homelessness,San Francisco city leaders have been getting heat for its estimated spending of $4 million out of its coffers for the Super Bowl-related events — mostly for additional police staffing and extra public transportation — without any reimbursement from the NFL or the local Super Bowl 50 Host Committee. And they will enjoy it, said Sam Yen, chief design officer for SAP. He said both kids and adults will get a kick out of the Quarterback Challenge, a third interactive game in which fans wearing a virtual reality headset become a quarterback in simulated game situations such as avoiding getting sacked or throwing a game-winning touchdown pass. Users can see how their fared against other competitors on a scoreboard.